Recently I purchased a post card for my collection. It was to be a duplicate, but I wanted it all the same because I liked the card and the written message on it. 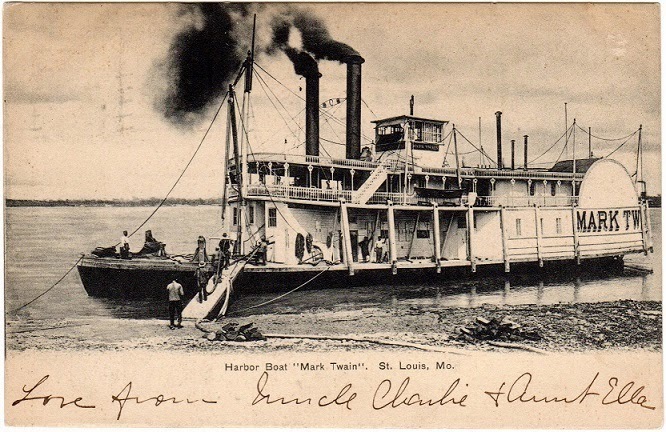 The card is labeled Harbor Boat “Mark Twain”, St. Louis, Mo. and has a picture of that boat in the early 1900’s. “Miss Ella” had sent it to a young fellow (based on the use of the title “Master” in the address), perhaps a neighbor's son or a favored student, for speculation sake. On the front she had written, “How would you like to ride on this boat?”. 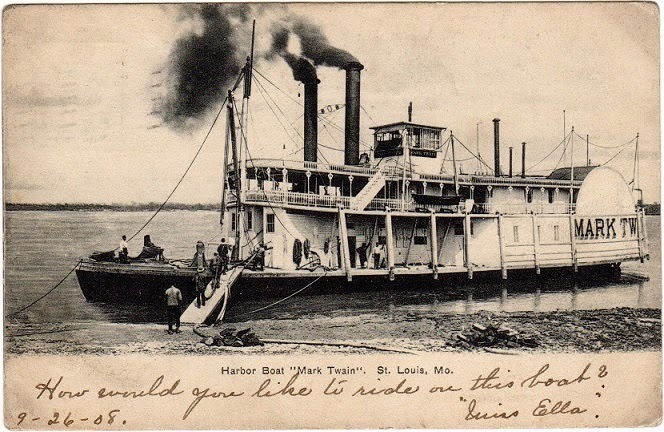 The card is dated 1908, and what red-blooded young man of that time would not want to ride on a steamboat? Perhaps he even dreamed of piloting steamboats just like the boat’s namesake, Mark Twain, had done. At any rate it is a card and message that can easily promote a bit of pleasant daydreaming. Now, to the rest of the story. 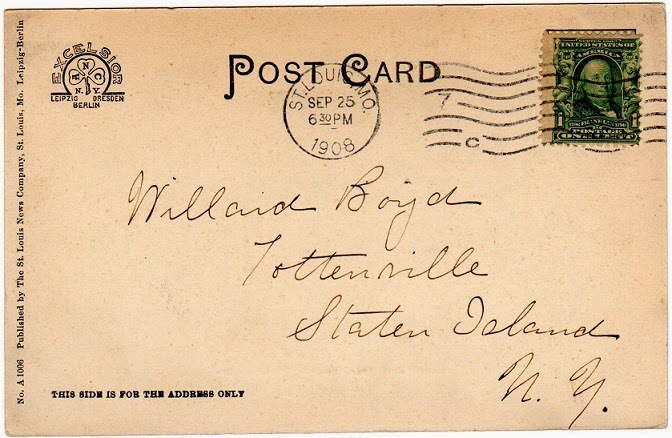 I recorded the card in my database and noted that it was postmarked September 26, 1908. When I filed the card, I pulled out the duplicate card I had purchased previously and looked it over. It too had a message on the front, “Love from Uncle Charlie & Aunt Ella”. 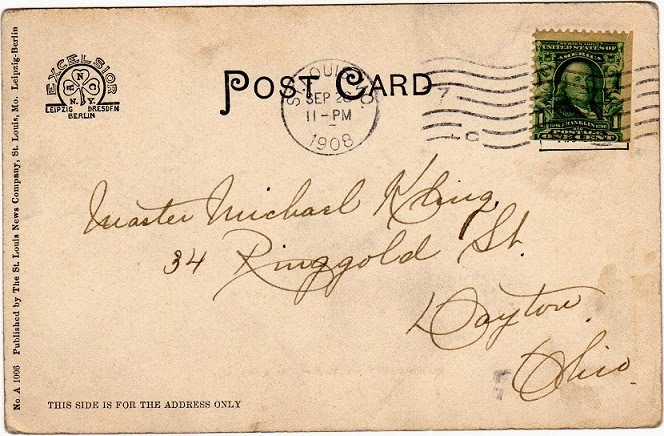 Then, on the back I saw that it was postmarked September 25, 1908. Both cards were postmarked from St. Louis. The writing on the two cards is similar but does not look exactly alike. Still, it’s quite possible that one was written by Charlie and the other by Ella. There is solid ground to conclude that these two cards were sent by the same couple just one day apart in September of 1908. I had purchased the first in March, 2007, and now in January, 2015 had come into possession of the other. Perhaps Charlie and Ella sent even more of that same card while on that trip to St. Louis, and eventually they too will find their way here. Good times. Good times.